2. connect filling machine to packing machines. 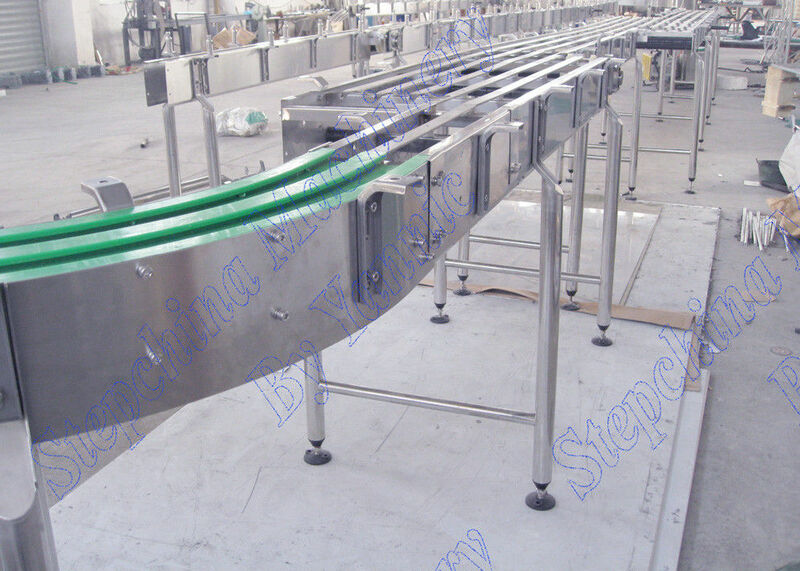 The product consists of holder, motor and conveying belt. 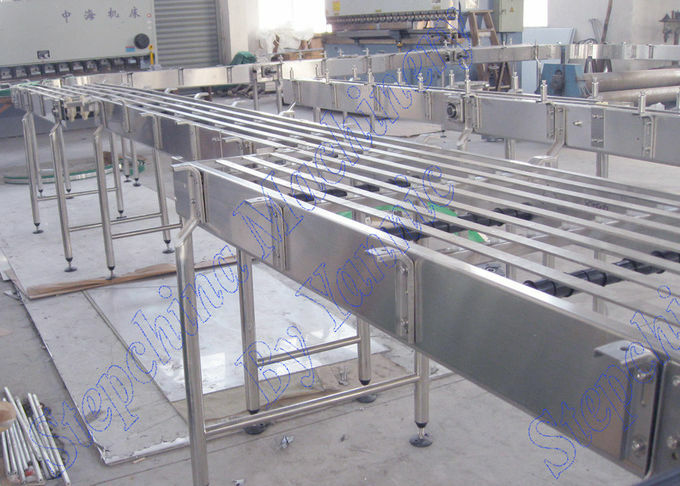 It is used to connect filling machine with various packaging machines and convey bottled beverages to help finish packaging final products. modular design is characterized by making products more diverse, simple and more changeable with other components, and install and maintenance convenient. According to specific requirements of users, different production capacity, and bottle shapes, it can also be combined into different conveying methods, module units, motors and control ways, thus this system enjoying high flexibility. The conveying belt and bottle protecting railing are equipped around turning and path-changing places at the size requirements of calculating. Then according to tests and theories, it can be calculated the change of velocity of every bottle belt, which increases or decreases in line with the progression of equal ratio. Finally, along with the synchronous control of bottle belt and main motor, it can achieve no overturning, no jamming, and no blocking while conveying, thus making bottles in conveying process no overturning, jamming and blocking. In order to successfully avoid bottle squeezing and blasting, controls between bottle belts, especially on high-speed conveying belt, adopt the mixture of coordinated and simple controls. The control components are approach switch, photoelectric tube, sensor and so on. Users can figure out practical control way according to different requirements of graphic designs in order to achieve stable conveying. 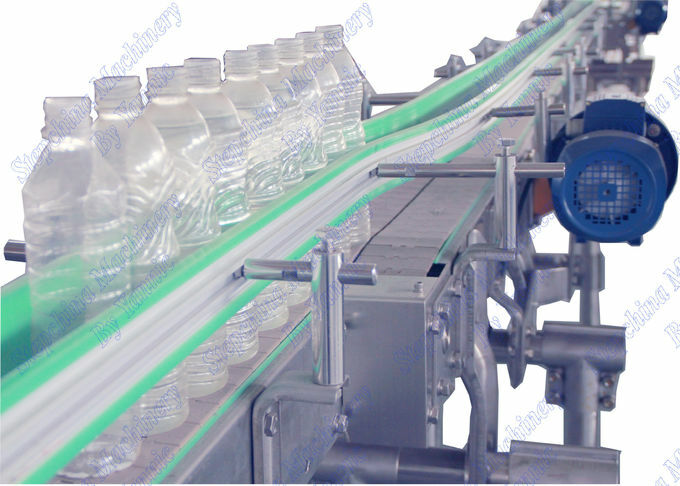 The electrical machine of bottle conveying belt are directly connected with bottle belt driving shaft, not using chain wheel conveying mode to transfer driving force as the traditional way. So the equipment enjoys compact structure and makes little noise. Besides, because of separate arrangement of electrical machine control box in line with specific graphic design, this device is quite convenient to operate. equipment are all made of stainless steel SUS304. air filter is equipped onto the last fan that is located in joint place of air conveying channel and filling machine. from entering rinsing filling capping machine by manual control or by cooperation with filling machine.